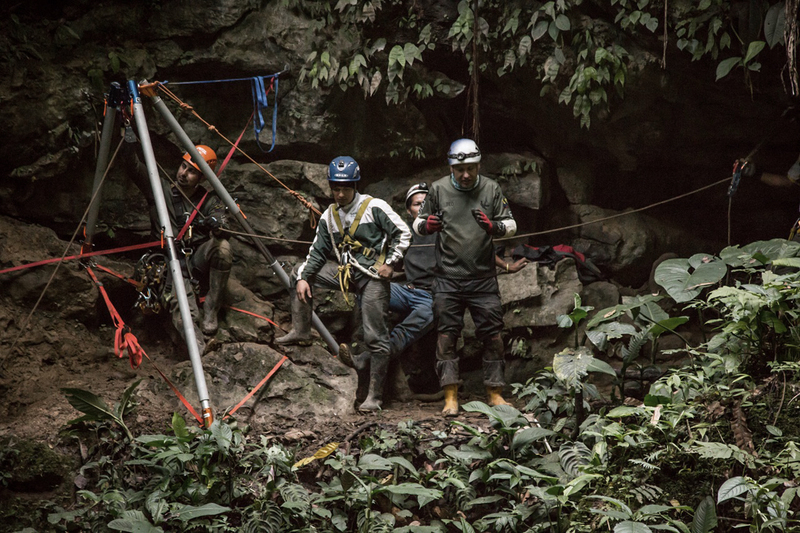 CMC PRO > Blog > Access > Rope Access > Expedition Unknown Teams Up with CMC™ for a Thrilling Adventure in Ecuador’s Tayos Cave System! 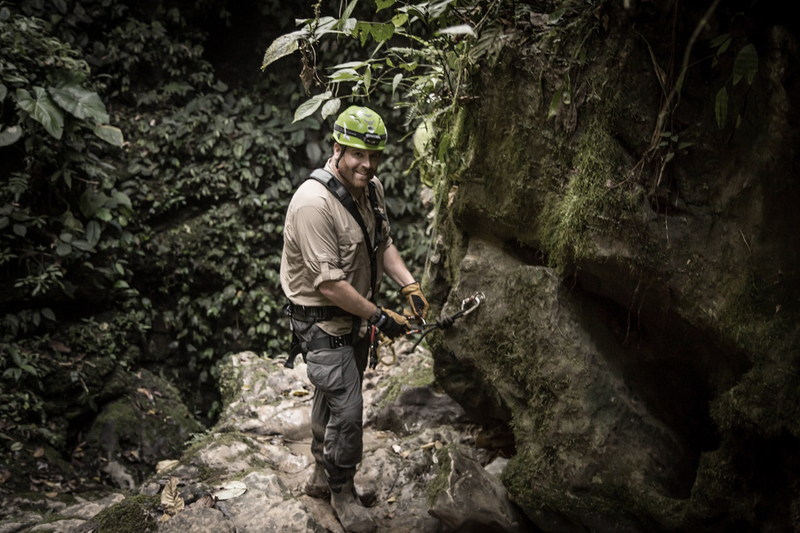 Expedition Unknown Teams Up with CMC for a Thrilling Adventure in Ecuador's Tayos Cave System! 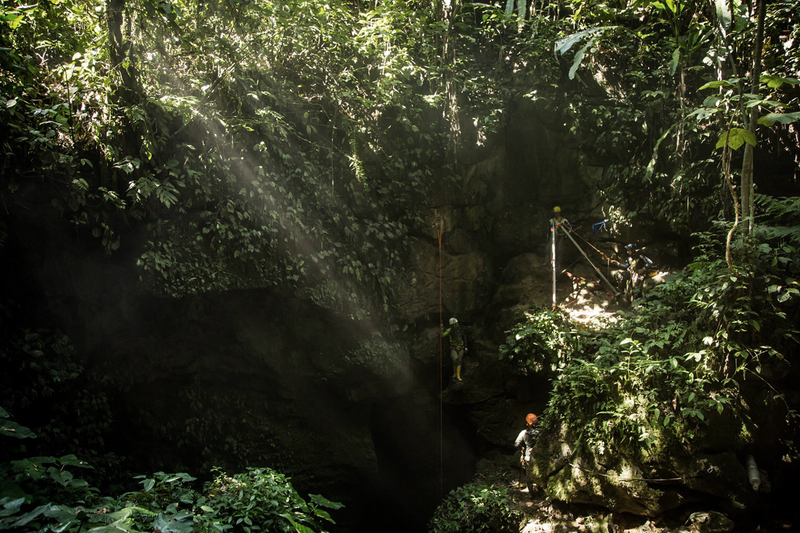 Last year, the producers of the Travel Channel’s popular series Expedition Unknown (EXU) approached CMC with a request to help provide the proper training and equipment for a team to safely gain access to and explore the Tayos Cave System, deep below the Amazon rainforest in Ecuador. Such a feat would require a team of 20 people, half of whom had limited rope experience, to rappel 260 feet inside the cave, alongside 500 pounds of gear! Supervising Producer Shawn Michaels describes EXU team’s thrilling journey to enter–and exit–the caves in the text below. Our experience working with CMC was nothing short of professional. Expedition Unknown has taken the crew around the world to some of the most remote places on this planet over the past 4 seasons. 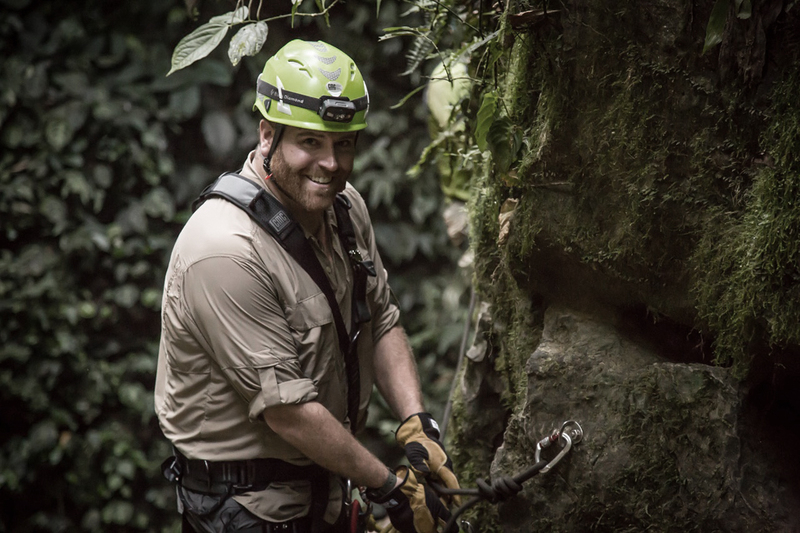 The Ecuador episode which we teamed up with CMC, was a very ambitious undertaking that would ultimately put the whole EXU team hundreds of feet down under the Amazon forest. As the Supervising Producer for this show, it is my job to ensure that what we are attempting to accomplish will be nothing short of successful. Safety is always the first concern when working in such a remote environment, so we turned to the pros! CMC not only provided us with the equipment we needed, but gave us the confidence to accomplish our goals. The story we were setting out to tell takes place deep in the Tayos Cave system. A famous cave in Ecuador whose entrance lies within the domain of a Shuar Indigenous tribe, infamous for their practice of shrunken heads. After their approval of admittance, the only thing left standing in our way was access. You see, the only way into this cave was a 260 foot vertical rappel. We needed to get our team of over 20 people in to this cave along with 500 pounds of gear and supplies, and do it without incident. About half of the participants had very little to no rope training as they stared over the edge of this cliff. Nervous, but confident, I was certain the professionals at CMC had prepared us for this undertaking. The CMC team had me up to their state-of-the-art headquarter facilities in Santa Barbara, for some solid hands on training with John McKently, Director for the CMC School, and Joe Flachman, Product Marketing, weeks before we left the states. I was shown a few different options on how to get the crew in, and more importantly, how to get them out of this challenging cave. We ultimately decided the Arizona Vortex System coupled with a Harken® LokHead Winch was the ideal way to go. Our Ecuadorian cave guides were excited for us to bring this CMC equipment with us, as they have seen it, but have never used it before. The CMC Arizona Vortex made its way up to the mouth of the cave via transport on donkeys. Getting it there was the hardest part. Setting it up was a breeze, and the use of it was very intuitive after our training by CMC. Making sure to triple check the crucial safety procedures that CMC advised me of back in California, I was able to sign off on the commencement of entry. We were able to get the crew and gear down without any problems. At the bottom, there was the feeling of having to get back out. This was daunting for those who had not seen what this amazing setup was capable of. We spent 3 days in the cave before it was time to come out. I was one of the first ones up and out to make sure the rig was set up properly and nothing had changed since we left it topside. All was good, and we started the extraction. It took roughly 7 minutes to winch each individual up. We connected a battery operated right-angle drill to the winch for ease and speed. After the last man up, we all knew we had accomplished something remarkable. I can say with confidence, this episode would not have been possible without the help and expertise of CMC. From their harnesses to helmets and gloves, from the rope to the hardware, you can see the attention to detail needed to provide this level of safety. It is very easy to see why they are the leaders in safety in high-risk environments! Tune in to the Travel Channel on March 28, 2018 at 11pm | 10c to watch the full episode! Or watch the full episode of Expedition Unknown’s episode Hunt for the Metal Library here.